The Affinity range from Elddis is designed to delight the most discerning of caravanners. 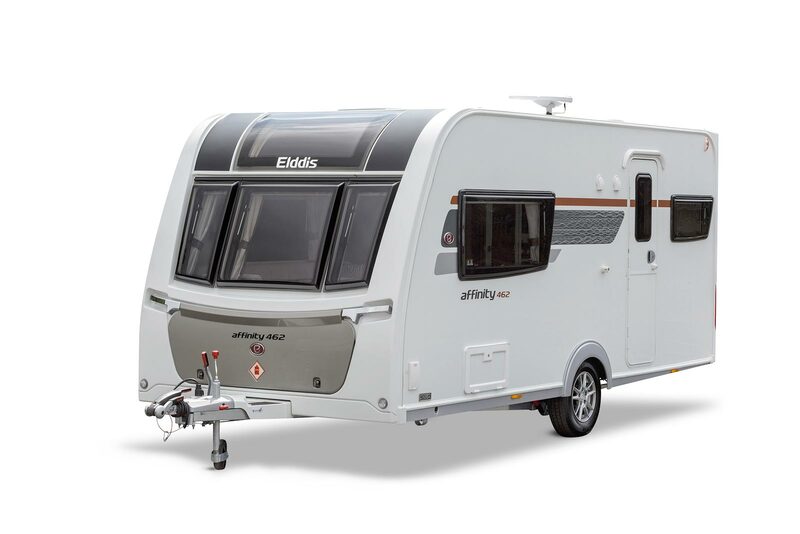 The multi-award-winning Affinity is an exciting and totally unique range of lightweight luxury touring caravans – all with Alde’s central heating system, Sky-Scape panoramic sunroof – yet all weighing in at less than 1500kgs MTPLM! The Elddis Affinity range from Elddis is designed to delight the most discerning of caravanners. The multi-award-winning Affinity is an exciting and totally unique range of lightweight luxury touring caravans – all with ALDE’s central heating system, Sky-Scape panoramic sunroof – yet all weighing in at less than 1500kgs MTPLM! Despite its light weight, the Affinity boasts an abundance of features as standard, quality craftsman-built cabinetry, and stylish detail inside and out. You can have it all… and at a surprisingly affordable price! 4640mm / 15'3'' 5780mm / 19'0" 5750mm / 18'10" 5600mm / 18'4"
2560mm / 8'5" 2560mm / 8'5" 2560mm / 8'5" 2560mm / 8'5"
The Mass in Running Order includes a manufacturing tolerance for material variances and 10kgs per gas bottle, the number of bottles is equal to the number of connections provided at the regulator. Maximum User Payload includes the Personal Effects payload and the Optional Equipment Payload. Please take care to ensure that you have allowed for the masses of all items you intend to carry in the caravan. Warning under no circumstances must the plated MTPLM of the caravan be exceeded. The porch awning height is measured directly above the main entrance door. All data is calculated using metric weights and measurements. The imperial figures quoted are conversions thereof. The overall height measurement is taken with the aerial in the lowest position. Finance just got more flexible! Making a large purchase like a caravan or motorhome can be a daunting experience, so you’re going to want someone on your side to help you through. With over 30 years experience of providing point of sale finance to help customers realise their dreams, Black Horse is the only finance company with a team dedicated to caravans and motorhomes. Our finance peartners Black Horse are heare to make life easier!